Landscapes are built to improve the value of one’s homes. But poor maintenance of these landscapes can achieve just the opposite. Instead of benefitting you, landscapes may cause annoying damages to your home. One of the culprits is lack of or a faulty landscape drainage system. This article aims to answer some of the basic questions that may have been bothering you for months. Why do I Need a Landscape Drainage System? Water runoffs or puddles forming in your yard reduce the aesthetic appearance of your landscape. Aside from this, unregulated standing water may damage your landscape and your home. Because we cannot see how water moves, we fail to see its impact. Cracks in foundations and walls, windows that cannot be closed or opened properly, and floors and doors that shift and buckle are some of the manifestations of your home settling caused by a faulty drainage. Fortunately, this problem is absolutely preventable through installation of a landscape drainage system. How to Choose the Right Landscape Drainage System? In choosing your drainage system, it is important to consider various things. The first step is to assess your current drainage system or evaluate the issues you have that were probably caused by the lack of it. If you are simply being preemptive, you can consult a reliable landscaping designer. Knowing your exact problems or objectives will allow you to select the best tools and system for your drainage. Here are some of the landscape drainage systems you can utilize. A downspout is a pipe that carries rainwater from the roof gutter and drains it to the ground. This leads to accumulation of runoffs on the ground. In other systems, a pipe is connected to the downspout. This is also not good because eventually debris will cause the drainage system to clog. A better drainage system installs a catch basin underneath the downspout or away from it but aligned with the drain pipe to which the downspout is connected. The catch basin prevents the system from clogging as it catches the debris and redirects the water. Runoffs may also accumulate around your plants, which may cause overwatering and later on drowning of your plants. The solution for this issue is to install round drainage basin or square catch basin in your planter area. The basin will immediately remove excess water before they can accumulate and drown your precious plants. An atrium grate catch basin is a better option than flat grates as the former cannot be clogged by debris and molds. Landscape naturally absorbs water. However, when water falls in great volumes and becomes saturated, the landscape can no longer absorb them. Thus, puddles are formed. The formation of puddles may be eliminated through installation of catch basins in several low, runoff-prone areas in the lawn. These are rectangular linear drains installed in driveways or patio that collect and redirect water to safer areas before it can go inside the house or touch other structures and landscapes. Finally, you must choose a proper way of discharging water because it will not just miraculously disappear. Numerous water draining and leaching systems are available in the market; it is up to you to consider the best one according to your needs. 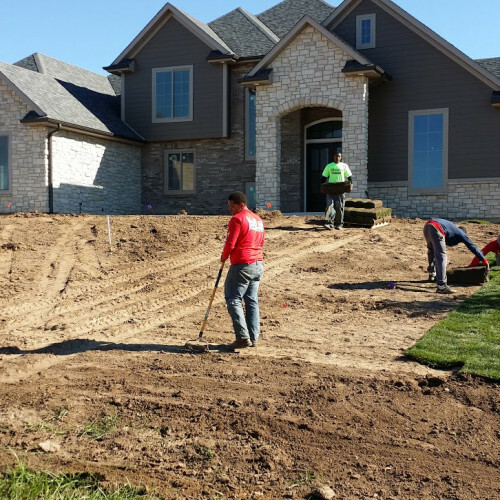 Installing a proper landscape drainage system will add value to your home environment and will also relieve your from possible water runoff problems. Written by Clark Jones, owner of Tree Frog Complete Grounds Maintenance. Tree Frog is the best company for landscaping in Columbia MO.